Thanks to Mike G0MJW for the recording. 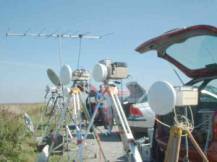 24 – 47 – 76 GHz Microwave Activity Day at Hackpen IO91CL21 on 5th September 2004 are shown left and right. Video links are to the right of screen. This OCXO left uses a 5th overtone crystal and has been developed to provide improved frequency stability when operating on all the microwave bands. It has varicap frequency control for fine preset adjustment or for connection to a PLL such as the Reflock CT1DMK design. Click here or on the image left for more MKII OCXO information. This module pictured to the right uses the same oven circuit as the MKII OCXO but is for use at 5 or 10 MHz or any specific similar frequency. Using a fundamental mode AT cut crystal the circuit incorporates crystal drive level control and provides a 0dbm sinusoidal output signal into 50 ohms. 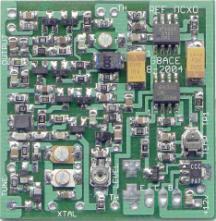 The circuit was designed by G8CPJ and implemented here using mainly surface mount components and integrated into the existing G8ACE oven design. The Oscillator is varicap controlled for phase locking to GPS, BBC Radio 4 on 198Khz or similar reference transmissions. The 10 MHz signal can be distributed around your microwave station via an amplifier to phase lock OCXOs as above. This is a new version of the pcb and is now now 40mm square to ease construction. Box Size 55 x 55mm. more information. Using four semiconductors the output power of the module shown left is 40mw from less than 1mW drive at the band centre. Drive level control is incorporated. All tuned inductors are printed. 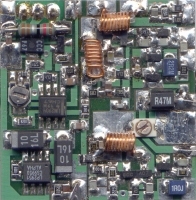 The Output Filter is located at the top of the PCB. The on board 9v regulator on the underside. Omitting the last stage the module can be used at 23cms. Module size is 110 x 55 x 30mm. Further details here or click the image.